How To Enable Aero Snap in Ubuntu Linux Using Compiz - OMG! Ubuntu! Ubuntu users can get a the cool functionality of Windows 7’s “Aero Snap” with a few copy’s and a few pastes thanks to an awesome tutorial on the UbuntuForums by forum-er gotsanity. Props and cookies go to him for this. What Is Aero Snap And Why Should I Use It? For those who don’t know what Aero Snap is i shall try and sum it up in on sentence: Aero Snap allows you to minimize, maximize and resize windows by simply drag-dropping them to the sides of the screen. 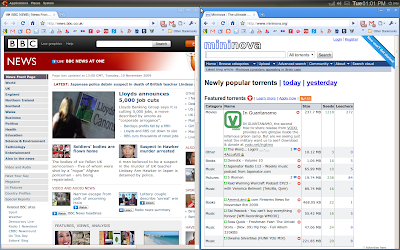 It’s useful for comparing the contents of two windows side-by-side. Drag them away and ta-da! they resize back. Now you’re all set to begin. Click on the back button and go to ‘General options’. Set the ‘Edge Trigger Delay’ to something around 400 – 500 by dragging the slider to the right. Now all you have to do is drag a window to one of the specified sides and your window will automatically resize.